Dina Iordanova’s imaginative analytical investigation of the films of Emir Kusturica is a distinguished contribution to the BFI’s World Directors Series. 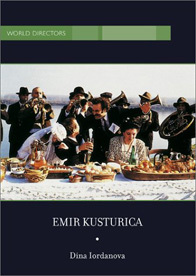 It admirably fulfils the series’ objective: “to present and to discuss the work of the leading directors from across the world on whom little has been written and whose exciting work merits discussion in an increasingly globalised film culture.” In the case of Emir Kusturica the phrase “on whom little has been written” seems on the way toward obsolescence, as Iordanova’s carefully selected bibliography attests. Iordanova skilfully synthesises the wide-ranging critical insights of other authors and critics cited in her book, at the same time opening numerous additional windows of opportunity for further and more focused research on various aspects of Kusturica’s rich and multi-levelled film texts. Emir Kusturica’s film work defies easy description and analysis. His style has evolved into a highly individual, exuberant, richly evocative, carnivalesque visual circus which, at its most exhilarating, dazzles and bedazzles the viewer. His films have won two Palmes d’Or (a rarity in the history of the Cannes Festival) and numerous other major international prizes. They have attracted an increasingly admiring audience worldwide and Kusturica himself has emerged as one of the last examples of the European auteurist tradition. In North America, unlike some other parts of the world, Kusturica has a relatively small following among the general film-going public and is mainly known and admired by film students and dedicated cineastes (including, of course, electronic addicts of Senses of Cinema and readers of other serious film journals). While many critics have praised Kusturica’s robust imagination and boundless creativity, others have found his films excessive, over-the-top, exoticised and overrated. Kusturica’s ventures into historicity and the larger political realm, most notably in Underground (1995) produced the most vociferous controversy. Soon after the film was awarded the Palme d’Or, the French critic Alain Finkelkraut touched off an eight month debate in France by labelling the film “a rock, postmodern, over-the-top, hip American version of the most drivelling and lying Serbian propaganda.” For others, the subject of the film has nothing to do with Serbian nationalism, but depicts the perverse consequences for individuals of authoritarian power (Communist or otherwise), repression of the ‘natural,’ and lying political manipulation. Still others see the film as exploring the underground regions of desire, fantasy, and dream in which Eros and Thanatos are fatefully intertwined. Rather than plunging headlong into the maelstrom of conflicting critical stances regarding Kusturica’s films and his personal aesthetics and ethics, Iordanova wisely chooses to follow a course of analytical investigation and balanced discussion rather than one of polemic confrontation and one-sided political stigmatising. She selects four entry points to achieve a better understanding of Kusturica’s films: 1) the man himself – his background, influences, professional training, as well as his personal life and philosophy (as far as these have been made public through various interviews), 2) the evolution of Kusturica’s thematic and narrative concerns, 3) film form and film aesthetics, and 4) the ideological and political substrata of his work – both explicit and implicit. Iordanova’s approach to an understanding of Kusturica’s films has several notable strengths. First, it provides multiple entry points for serious critical engagement with the filmmaker and his dominant thematic and aesthetic concerns. Iordanova is more interested in promoting critical dialogue and multiplicity of approaches than in dogmatically pursuing a single theoretical perspective: she lays out a road map with several alternative routes to choose from. Second, the reader is provided with a thorough documentation of the most important critical writings and references on the subject along with a valuable index and filmography. Third, there is Iordanova’s thorough mastery of her subject and her eagerness to share it with clarity and cogency. At times, Iordanova’s thoroughness of coverage – her evident desire to leave no stone unturned – can weaken rather than strengthen her analyses. For example, her discussion of Kusturica’ s well known penchant for enriching his visual text with multiple citations and allusions to other films and popular junk culture (Euro-trash) leads Iordanova into a scavenger hunt in which trivial and dubious intertextual references are insufficiently distinguished from visual citations and transformations of major significance. On the other hand, she can be admirably succinct and convincing in her discussion of Kusturica’s multi-layered management of visual foreground and background, his sweeping use of travelling shots, stunning visual panoramas, and recurring images of aspiration and transcendence. Iordanova also opens up important avenues of discussion in her section on politics and ideology. Having already covered the political controversies surrounding Kusturica’s film Underground in her recently published book Cinema Of Flames, Iordanova focuses most of her attention in this section on critical perspectives on familial politics and ideology, including the patriarchal and patrilineal underpinnings of Kusturica’s major films, as well as his portrayal of complex family relationships involving betrayal and revenge, unresolved Oedipal complexes, and perpetually adolescent male protagonists. A brief review can scarcely do justice to this book’s breadth of coverage and the fecundity of its critical insights and analyses. It is an invaluable source book for film students, for Kusturica devotees (of which there are a growing number) and for film lovers who have not yet been introduced to the unique pleasures and exhilarating heights which Kusturica’s works provide. Daniel J. Goulding is Professor Emeritus of Film Studies, Oberlin College, and award-winning author of Liberated Cinema: The Yugoslav Experience, recently published by Indiana University Press in a new, expanded edition. The Horror of Not Seeing: Recovering 1940s Horror Cinema: Traces Of A Lost Decade, by Mario DeGiglio-Bellemare, Charlie Ellbé, and Kristopher Woofter (eds).